Here is what you need to know before the Lakers attempt to defend home court against the Minnesota Timberwolves. 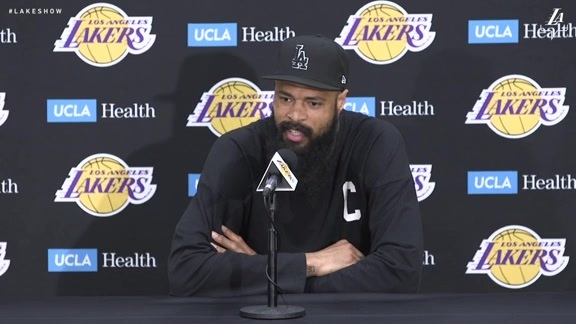 The Lakers have a new, 7-foot-1 center available off the bench, as Tyson Chandler signed with the purple and gold on Tuesday. Whether Chandler — who hasn’t been through a practice with the Lakers yet — will see action on Tuesday is undetermined thus far. Chandler will attempt to fill an area of need for the Lakers, who have yet to find consistent production from the players who have served as second-unit centers. The 18-year veteran will be primarily tasked with playing above the rim on offense, protecting the paint on defense, and attacking the glass on both ends. There are reasons for optimism. Last year, he ranked among the NBA’s 86th percentile among pick-and-roll big men. This season, he was Phoenix’s second-leading rebounder despite playing its 10th-most minutes. The Lakers are looking to rinse out a sour taste after trailing the entirety of Sunday’s loss to Toronto. The Timberwolves are in a similar situation, having dropped three straight by an average of 19.3 points. In short, it’s been a frustrating few days for two teams with playoff aspirations. Ironically, one of the areas that the Lakers could exploit is on the glass. L.A. is just 24th in the NBA in rebound differential, but Minnesota is 29th and allows a league-high 14.2 offensive boards. Limiting its opponents’ success on the glass has been paramount to the Lakers’s success so far, as they are 3-0 when holding their opponents to fewer than 45 rebounds, but 1-6 when allowing more than that. If Chandler plays, look for him to make an impact in this department. This game comes just nine days after the Lakers battled with the Wolves to a close loss in Minnesota. While LeBron James (29 points, 10 rebounds, eight assists) and Brandon Ingram (24 points) brought it in that contest, the Lakers were sunk by some clutch shooting from Jimmy Butler (32 points), who hit all five of his fourth-quarter 3-pointers (and has shot 0-for-10 on 3’s since). Butler — who has sat half of Minnesota’s last four games — has an undetermined status for this contest. But the Lakers recently learned not to underestimate teams down a superstar after their loss to the Kawhi Leonard-less Raptors. Besides, the Wolves have plenty of firepower even without Butler and starting point guard Jeff Teague. Karl-Anthony Towns is in nightly double-double mode, and Derrick Rose dropped a career-high 50 points in a single game just a week ago. Timberwolves: Jimmy Butler is day-to-day. Jeff Teague (knee) and Justin Patton (foot) are out.